Radical Glow Technology allows our products to GLOW EXTREMELY BRIGHT and EXCEPTIONALLY LONG in their own colors. It’s like having two products in one: The “day” colors you need like pink, natural green, chartreuse, red, and blue combined with a “Glow” of the same color as lighting changes or water darkens. Radical Glow colors provide over 10 times the brightness and 8 times the duration of conventional glow colorants. For best glow results, charge Radical Glow products with natural sun light or halogen lamps. Use Radical Glow when you want your bait and lures to be seen. See descriptions of our products below. Radical Glow Beads glow extremely bright in their own colors: natural green, glacier blue, chartreuse, radical red and powerful pink. For drift fishing and in spinners, use Radical Glow when you want your bait and lures to be seen. Our new UV Beads are a technology breakthrough. The first beads that have a daytime color that matches the color radiated in the water column. Smasher Beads are a complement to the Radical Glow line of fishing products. These non-glow, standard-glow, and painted beads give you the wide variety of colors that you want at a very nominal price. Used for their great daytime colors Smasher Beads are great in baits, drift fishing and spinners. 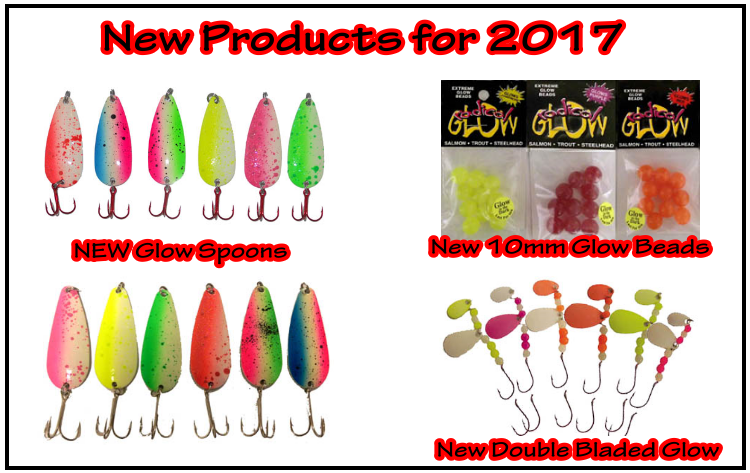 We offer a variety of sizes and colors of Radical Glow Tubes to match the needs of most fishermen. We have ¾ inch and 1-1/2 inch mini-tubes for Kokanee, Trout, and other game fish. Our new 2-1/4 inch Tubes are an excellent addition to the RGT line, with 9 new colors this size is great for king salmon and other larger game fish. We have 5 inch tubes for many freshwater and saltwater species and super sized 5 inch tubes for saltwater halibut, lake trout, and rockfish. Whether you're trolling lakes for Kokanee and Trout or rivers for Salmon, we have the Radical Glow spinner for you. With our Glow Spinners the extra long luminescence allows you to leave your spinner working in the water without having to recharge every 30 seconds. More time in the water means a better chance for a "Fish-on!" Our UV Spinners with our new UV Beads use the sun's ultra violent rays to radiate in 5 colors to attract fish. Radical Glow Caps are a 3/16" solid soft plastic cylinder. These glow in the dark caps are threaded onto the hook to represent a glowing maggot. More color and glow to attract the fish. Swirl Tails are a Radical Glow 1" Grub. The single swirl tail gives your hook the look of a swimming fish. Radical Glow Swirl Tails can be used on a regular hook or a croppie gig. Improving on a great product is difficult, but we have taken Thunder Balls to the next level with Radical Glow color. With popular red and pink “day” colors for clear conditions and the Radical Red and Powerful Pink “glow” color for murky water, your bait will always be seen. The buoyancy of the Thunder Ball Floats your hook just off the bottom where you want it and the day and glow colors is like two baits in one. RGT’s (Radical Glow Tubes) are now offered setup for your convenience. The 1-1/2” RGT’s are setup with 2 #4 red Octopus Hooks tied in Snell configuration. The 2-1/4” RGT’s are setup with 2 wider gap #3 red Octopus Hooks. Several sizes and colors now available. Great for both Jigging & casting.